Reading & Signing The Violet Fox (Faery Ink Press). Clare Marshall grew up in rural Nova Scotia with very little television and dial up internet, and yet, she turned out okay. She has a combined honours degree in journalism and psychology from the University of King’s College, and is a graduate from Humber College’s Creative Book Publishing Program. 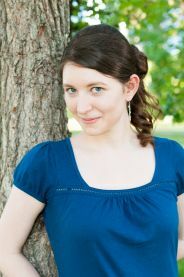 She is a full time freelance editor, designer, website manager, and publisher. When she’s not writing, she enjoys playing the fiddle and making silly noises at cats. There are two kinds of people in the land of Marlenia. The Marlenians, who live on the surface, and the Freetors, who are forced to live underground. The war between them ended two hundred years ago, but the Freetors still fight for the right to live under the sun. Fifteen-year-old Kiera Driscoll embodies the Freetors’ hopes as the Violet Fox. In a violet cape and mask, she sneaks around Marlenia City stealing food and freeing her people from slavery. Then the Elders task her with a secret mission: retrieve a stolen tome that contains the secrets of Freetor magic, something the Marlenians both fear and covet. Kiera must disguise herself as a noblewoman and infiltrate the Marlenian castle before the Freetor-hating Advisor finds out her real identity, before her brother is imprisoned because of the secrets he hides, and before she falls any more in love with the prince she’s supposed to hate. More is happening in the castle than she realizes, and Kiera is faced with a difficult choice. Will she be loyal to her people and their fight for freedom, or will she be loyal to her heart? Ships in 1 to 2 weeks.